A hub is the simplest of these devices. Any data packet coming from one port is sent to all other ports. That’s the sole purpose of a hub. It is then up to the receiving computer to decide if the packet is for it. Imagine packets going through a hub as messages going into a mailing list. The mail is sent out to everyone and it is up to the receiving party to decide if it is of interest. The biggest problem with hubs is their simplicity. Since every packet is sent out to every computer on the network, there is a lot of wasted transmission. This means that the network can easily become bogged down. Hubs are typically used on small networks where the amount of data going across the network is never very high. A bridge goes one step up on a hub in that it review the destination of the packet before sending. If the destination address is not on the other side of the bridge it will not transmit the data. A bridge only has one incoming and one outgoing port. To build on the email analogy above, the bridge is allowed to decide if the message should continue on. It reads the address bob@smith.com and decides if there is a bob@smith.com on the other side. If there isn’t, the message will not be transmitted. Bridges are typically used to separate parts of a network that do not need to communicate regularly, but still need to be connected. A switch steps up on a bridge in that it has multiple ports. When a packet comes through a switch it is read to determine which computer to send the data to. I.E. one computer will be the sole receiver of the package. This leads to increased efficiency in that packets are not going to computers that do not require them. Now the email analogy has multiple people able to send email to multiple users. The switch can decide where to send the mail based on the address. Most large networks use switches rather than hubs to connect computers within the same subnet. A router is similar in a switch in that it forwards packets based on address. But, instead of the MAC address that a switch uses, a router can use the IP address. Before forwarding a packet the router will review the destination IP address. This allows the network to go across different protocols. 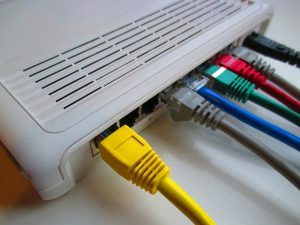 The most common home use for routers is to share a broadband internet connection. The router has a public IP address and that address is shared with the network. When data comes through the router it is forwarded to the correct computer. This comparison to email gets a little off base. This would be similar to the router being able to receive a packet as email and sending it to the user as a fax. Need some practice? Review your skills. I just put up a new quiz site called EasyQuiz.info. As it works out, the first quiz I put online was a set of questions that I wrote on the “Connecting to the Network” chapter from the Cisco Discovery 1 curriculum, by S. Frazier. The Cisco Discovery 1 curriculum is a somewhat elliptical curriculum, that teaches general networking theory, for network administrators. If you’re needing a bit of practice with network addressing, I’ve just put up a new site at network-practice.info where you can review your knowledge, practice working with network addressing and binary to decimal conversions and back. can you please give all this comparioson between network control devices in chart form? which will be helpful to understand it easily and comparitively. I agree with the question of Mrs Priyanka. can u tell me that what is subnetting and subnet masks ? @Ammar – That’s something that could be several pages of explanation and not something that would neatly fit in a blog comment. Thanks for the info its very useful. Short, clearly, easy to understand. Thanks for this overlook! It helped me very much to get access to my learning stuff for the university. This introduction was exactly what I was looking for after having taken the first look inside my study documents. Thanks a lot! Greetings from Germany! Thank you so much for breaking all of this down! I really needed this for a course paper. Very nice article. Exactly what I was looking for. n it is better to explain it diagramatically. It’s really good…. i appreciate this…. Good document. Brief, clear and easily understandable. Not to be a jerk (and perhaps I’m even wrong), but when you talk about a switch forwarding a packet shouldn’t it really be a frame? It’s really helpful for the beginners; but it is one step up to the good understanding of the device functions. A bridge typically changes from one type of connection to another. For example, my computer is plugged in to an Apple Airport Express that acts as a bridge to the rest of my wireless network. So it bridges between a wired cat5 connection and a wireless connection. A switch typically is multiples of the same type of connection. So you might have a switch with 5 ethernet connections that can all talk, but the switch acts as traffic control between them. Thank you for simple yet very clear explanation of these things. it is realy simplest documents….thankx a lot…..
this make me understand the correct difference between router,bridge,switch and hub………. without reading this i m not able to understand..
can router use as a switch? Easy and really explicit breakdown of knowledge,nice.More. Can we manage a bridge? can we make VLANs in a bridge? Bridges are software based, whereas switches are hardware based. Bridges too can have mutiple ports. Am I wrong? Windows lets you create a software bridge if you have a computer with 2 or more network connections. I did this for a while with my media center computer to bridge its wired and wireless connections so that a couple other devices could also connect via wireless. A little hinky, but it did what it needed to do. But bridges can be hardware too. I’m using an Apple Airport Express under my desk to connect two sections of wired networks together. DHCP server is on one side and both sides have a switch connecting multiple ethernet devices together. One switch connects to the Airport Express which gives that entire side access to the wireless connection. Thank you for taking the time to explain all this stuff. Would you mind drawing this out visually? It doesn’t have to be pretty… hand drawn on a piece of paper and scanned or just draw boxes / lines in like Paint or whatever would be so helpful. I’m really having a hard time visualizing your setup to see the benefits of a bridge over a switch. This is really helpful and very simple language and understandable doc. I just tell you I become always confused about all devices. Now I can distinguish them all. Thanks, this is a very nice concise explanation, cleared it right up for me. Wrong! Bridge has many ports. The bridge is the part that switches from one type of connection to another and is one connection to one connection. It may be that a switch or router has a bridge built in though, and that would have multiple ports. Look at the Apple Airport Extreme . I’ve got one on my network that acts as a bridge to an Airport Express on another part of my network. Yes, the extreme is acting as a bridge and has multiple ports. but that’s because it’s also a router. All the bridge is doing is connecting an ethernet section of the network to a wireless. For that matter, the Express is acting as a bridge and only has one port. The second port is wireless. It’s a simple but great explanation, thanks!! Tanks for using simple words to explain the difference,it was easy to understand this way. The material is comprehensive enough for a non technical person to understand. Many thanks to you guys for your wonderful contribution of knowledge to the Field of ICT. Thank You fr sharing! Helped! What are the differences b/w regenerator, repeator and transparent bridge ? it need some diagrams and some more features. wow…. this is a great explanation. I have checked on youtube and several other websites and yours was the first article that i understood properly. Thanks Ryan for sharing your knowledge. tanx a lot …… for sharing knowledge but year of introduction shared? Diff b/w Switches, Bridges nd Routers. Which one is better nd why? The Article Was Nice . Keep It Up. very soft information in this artical,so we learn easily and abstract the information from every one. Hey, it 2018 and someone is still looking at your old thread, great stuff, ” neat and simple”.